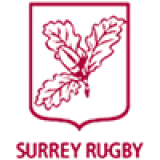 Surrey U18s led Hertfordshire by 24 points to nil at half time in their first County match of the season on Sunday 29th October, but a dominant second half by the visitors saw them score 39 unanswered points in the second half to come away with a 24-39 win. So lots to work on before Surrey's next match on Sunday 3rd December, away to Middlesex at Old Merchant Taylors. Try scorers for Surrey were Charlie Green, Gresham Lynn, Finlay Savill and Theo Barkway Hall. Charlie Cadogan added two conversions.